The GearWrench 1/4'' drive long handle full polish teardrop ratchet features an enclosed head design for extreme resistance to dirt infiltration. A teardrop low profile head and flush mounted on/off switch allows the GearWrench 1/4'' drive long handle full polish teardrop ratchet better access in tight spaces, while the longer reach handle allows access to hard to reach fasteners. The GearWrench 1/4'' drive long handle full polish teardrop ratchet is coated in a full polish chrome finish. This ratchet meets or exceeds ASME b107.10. The 81028 GearWrench 1/4'' Drive Long Handle Full Polish Teardrop Ratchet is one of thousands of quality tooling products available from MRO Tools. 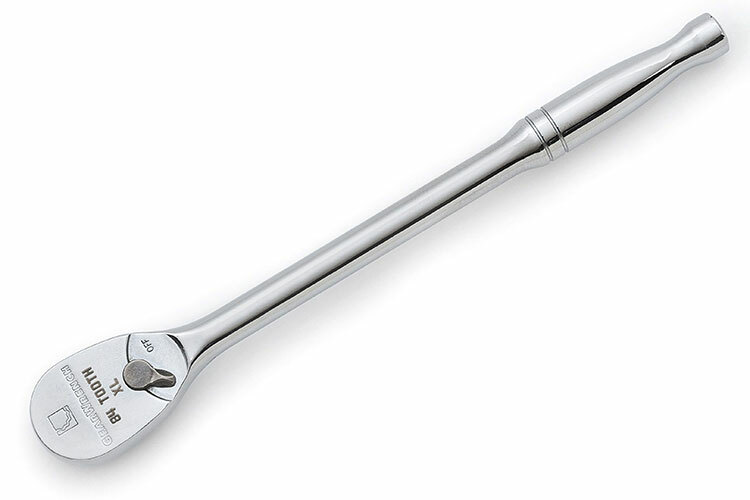 Please browse GearWrench 1/4'' Ratchets for tools similar to the 81028 GearWrench 1/4'' Drive Long Handle Full Polish Teardrop Ratchet. 81028 GearWrench 1/4'' Drive Long Handle Full Polish Teardrop Ratchet description summary: GearWrench 1/4'' drive long handle full polish teardrop ratchet. Overall Length: 6.87'' Head Width: 0.96'' Head Thickness: 0.35'' Number of Positions: 84 Quantity discounts may be available for the 81028 GearWrench 1/4'' Drive Long Handle Full Polish Teardrop Ratchet. Please contact MRO Tools for details.